Aurora Chorus is a non-profit 501(c)(3) organization. Your generous support keeps our community thriving. All donations are tax-deductible. The Eileen Spencer Scholarship Fund assists chorus members with membership fees when financial challenges arise. The Fund was started in 2008 after Eileen’s death to honor her love for Aurora. Contributions to the fund ensure that any woman who wishes to sing with Aurora will be able to participate regardless of her financial ability. Approximately one-third of all singers rely on financial assistance to pay their fees each term. Support Aurora while you shop! You can help Aurora Chorus earn donations just by shopping with your Fred Meyer Rewards Card! 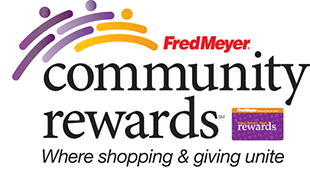 Sign up for the Community Rewards program by linking your Fred Meyer Rewards Card to Aurora Chorus. You can search for Aurora Chorus by name or by our non-profit number 88060. Every time you shop and use your Rewards Card, you are helping Aurora Chorus earn a donation! You still earn your Rewards Points, Fuel Points, and Rebates, just as you have been. Did you know that you can contribute to Aurora just by doing your regular shopping on Amazon.com? All you need to do is go to smile.amazon.com, select Aurora Chorus Inc as the charity you are supporting, and Amazon will automatically donate 0.5% of your purchase to Aurora. Just make sure to always visit smile.amazon.com rather than www.amazon.com or the donation will not be made. You can find a copy of Aurora’s annual 990 reports on Guidestar.